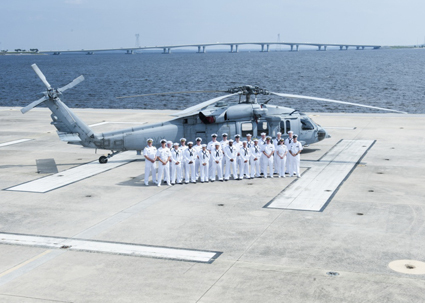 After 63 years of flying test and evaluation mission flights, the Naval Surface Warfare Center Panama City Division Dragon Masters Aviation Unit was deactivated in a ceremony Friday, Sept. 8, 2017. The aviation unit mission was to fly test and evaluation missions for the only Navy lab located along the Gulf Coast. The unit is presently comprised of 28 military and 25 contractors and two MH-60S aircraft flown not only test and evaluation, but also Search and Rescue flights. The aircraft will be returned to Fleet use in San Diego, California Sept. 10, 2017. Of the 28 military and 25 contractors assigned to the Dragon Masters, at least five military billets will be retained as well as at least three contract positions. The military will phase out over a three year period between fiscal year 2018 and 2020. These personnel will be retained to maintain the flight line and keep it open for MH-53E squadrons to train at the command annually as well as conduct Unmanned Aerial System (UAS) test flights using drones less than 55 lbs. Additionally, a Landing Craft Air Cushion (LCAC) detachment of up to 100 Sailors will use the aviation unit as they train on the next generation of LCAC presently being built at Textron, Inc., in Mobile, Alabama. In 1954, NSWC PCD – then called the U.S. Mine Defense Laboratory – became known for conducting the first successful airborne mine countermeasure test flight in the waters of St. Andrew Bay using a sonar tow array called the Shadowgraph. By 1965, the command was a critical asset to mine countermeasures in Vietnam and later in Korea. Since then, the command has experienced several technical achievements, to include supporting the successful completion of the Airborne Laser Mine Detection System and Airborne Mine Neutralization System through the Department of Defense acquisition milestone known as Initial Operational Test and Evaluation. In 2013, the Dragon Masters made headlines after utilizing their SAR capabilities and rescued a stranded mariner from the Gulf of Mexico, but that is not the first time the unit saved people from the Gulf. In February 2017, the Dragon Masters successfully flew a test flight that allowed aircrew members to insert a MK-18 unmanned underwater vehicle into the water to sweep for mines and be utilized as a mine countermeasure deterrent.